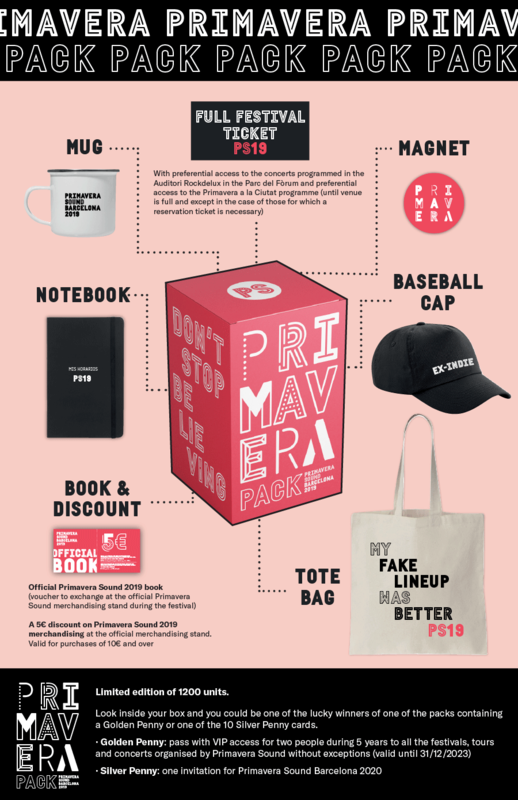 Once again, Primavera Sound will offer its now traditional Primavera Pack that, as well as the 2019 full festival ticket, contains exclusive presents and special advantages for the next edition of the festival, that will take place from 30th May to 1st June in Barcelona. - A 5€ discount on Primavera Sound 2019 merchandising at the official merchandising stand. Valid for purchases of 10€ and over. Also, 10 Primavera Packs will contain Silver Penny cards (one invitation for Primavera Sound Barcelona 2020) and one Primavera Pack will contain a Golden Penny card (pass with VIP access for two people during 5 years to all the festivals, tours and concerts organised by Primavera Sound with no exceptions, valid until 31/12/2023). The pack is now available on pre-sale at the price of 185 € on Redtkt and soon on Ticketmaster. The dispatch of purchased packs will start on the 15th December. Available until they sell out (limited edition of 1200 units). From the lineup release and until May 2019 it will be likely, usual and even advisable to feel thrilled and get butterflies.